What is Mac File Opener? Mac File Opener is a tool which allows you to open any type of file on your Mac machine. There are various file extensions on your system that can’t be opened with any of the installed apps. This problem can be fixed with Mac File Opener as it helps you to detect suitable apps for your file and then view it. The app searches the entire web to quickly find a compatible app which can open the file. 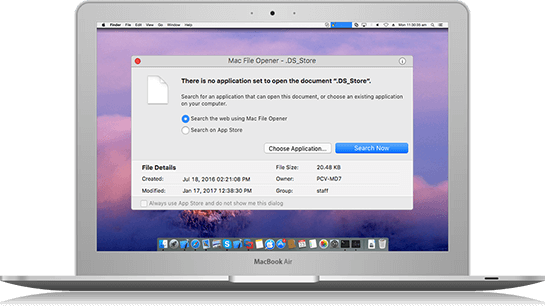 Any unknown file extension could be opened with the help of Mac File Opener. It has a large database which stores several file extension entries. Whenever there is an unknown file extension, Mac File Opener matches the extension with the relevant apps on the web to open it. Mac File Opener reduces manual effort as it has a huge database which makes it easier to search the web and find the suitable apps quickly. How to get Mac File Opener? We aim at enhancing your overall Mac experience, which is why we are giving away Mac File Opener with the ultimate Advanced Mac Cleaner. Install the tool to get Mac File Opener & begin your search for unknown file extensions on your Mac. This tool quickly let me hunt down a file extension I was looking for since a long time. Works perfectly! It helped me open a very important file I downloaded over the web.